This article needs expanding. Please help by adding some relevant content. 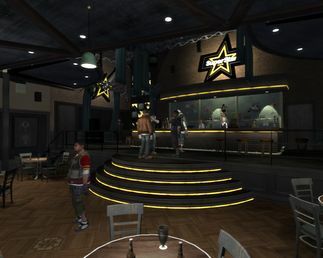 The Superstar Cafe, the location of this mission. First Impressions is one of the Stubbs' Dirty Laundry side missions in The Lost and Damned, given to Johnny Klebitz by Thomas Stubbs III. The mission involves Johnny going to the Superstar Café to kill one of Stubbs' politician friends. When you arrive, just find a place to wait. Wait until he is done talking then kill him. After that you have to kill three or four bodyguards of his and just quickly escape. Drive a few blocks and it will be complete with a following phone call to Stubbs. Stubbs wants you to kill one of his politician friends at the Superstar cafe. Once you've arrived, go inside the cafe, and halfway down the stairwell on the right, where the guards can't directly shoot you. At this point, proceed to kill the politician, and any guards that come in your line of sight. After he's dead, you're free to make your getaway, and the mission will end once you drive far enough from the cafe. Taking a taxi to the destination will cause Johnny and the taxi to glitch in the interior of Superstar Cafe, and the guards will shoot at you. This page was last modified on 21 August 2012, at 23:20.